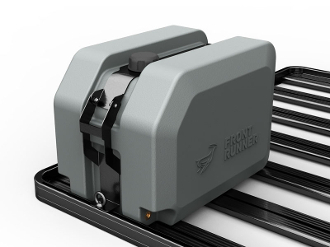 The Front Runner water tank was designed to be mounted specifically onto your Front Runner Slimline II Rack with a uniquely engineered mounting system. Perfect for showers, drinking, and cooking, this compact tank is perfect when space is at a minimum. Brass fittings on both sides of the tank mean you can customize placement of taps and/or hoses. Fitting size is 1/2 MIP. You will need to provide your own fitting or purchase our hose kit WTAN029. Made of food grade polyethylene and is BPA free. This means that your water is not tainted with a plastic-like taste. Fitting size is 1/2 MIP. You will need to provide your own fittings or purchase our hose kit WTAN029.